Award-winning playwright Tom Murphy, who worked closely with the Abbey Theatre and the Druid Theatre Company, has died aged 83. President Michael D Higgins has said the importance of his contribution to Irish theatre is "immeasurable and outstanding", and that he will miss him deeply. A native of Tuam, Co Galway, Murphy’s first one act play "On the Outside" was written when he was in his 20s. In 1961, his first full length work, "A Whistle in the Dark", was performed in London. The intense, angry play - set among Irish emigrants in the UK - had initially been rejected by the Abbey Theatre. Murphy was to return to the themes of emigration and displacement throughout his long career and other significant works included The Sanctuary Lamp, the Gigli Concert and Bailegangaire. His plays were performed all over the world and from 1984 until his death Murphy had a significant association with the Galway-based Druid Theatre, which included Druid Murphy, a 2013 production of three key works which toured Ireland, the UK and the US. In an interview at the time, Murphy said the happiest day of his life was seeing his work performed by the Druid for the first time. He said that having grown up just "20-odd miles away from Galway", he could ever have imagined that his plays and his writing career could have endured for so long. Described as a master of language and of dialogue, Murphy was the recipient of numerous awards, including honorary doctorates. He was named a Saoi of Aosdána in 2017 and presenting him with that award, President Higgins described him as a playwright of the emigrant whose contribution to Irish theatre had been immense and unique. In a statement, President Higgins said: "It was with great sadness that Sabina and I have learned of the death of Tom Murphy. "The importance of Tom Murphy's contribution to Irish theatre is immeasurable and outstanding. We have had no greater use of language for the stage than in the body of work produced by Tom Murphy since his earliest work in the 1960s. "His themes were not only those which had influenced the very essence of Irishness, immigration, famine and loss - they were universal in their reach. "From the early beginnings of his writings in Tuam, Tom Murphy produced a unique and often provocative body of work. He was above all the great playwright of the emigrant, more than anyone capturing, in a poignant, creative way, the transience that is at the heart of the emigrant experience. "It was such a joy to meet Tom so many times over the years, and a particular pleasure for any of us who have been privileged to call him our friend. "I had the pleasure of presenting Tom with the Aosdána torc in his home in 2017, a great acknowledgement by his contemporaries of his outstanding abilities as a writer. "Sabina and I wish to express our condolences to his wife Jane and to Mary, Bennan, Johnny, Nell and their extended family and his wide circle of friends. I will miss him deeply, but he will be fondly missed by all of us who had the privilege of knowing him." In a statement, Druid Theatre Company said it had lost a "friend, colleague, great Irish writer and a great man of the theatre". Expressing deep sadness at his death, the company said its links with the writer had been an important step in its development. Former director of the Abbey Theatre, Fiach Mac Conghail, says you never knew what was coming in a Tom Murphy play, because he experimented with form and structure. Druid actor Sean McGinley said Tom Murphy was a brilliant critic and analyst of his own work. He said that he believed his plays would be performed for generations to come. He told RTÉ’s Today with Sean O'Rourke that his abiding memory of Murphy was of him singing, because he would "sing at the drop of a hat". Mr McGinley added that he hopes Murphy "is singing now". 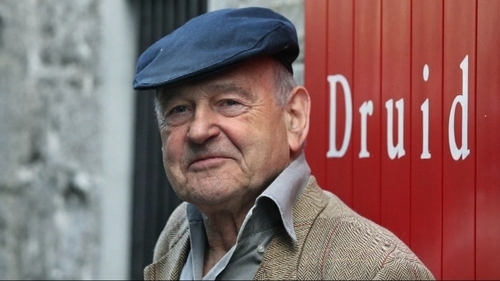 The Taoiseach Leo Varadkar described Tom Murphy as one of Ireland’s most important playwrights. In a statement he said: "I was saddened to hear of the death of one of our most important playwrights, Tom Murphy. His relentless imagination and his restless exploration of the human condition challenged us to think about the world differently and enabled us see our souls. His huge impact on Irish theatre will undoubtedly be felt for many decades to come. "Tom's ability to create roles that inspired actors to give some of their greatest performances was a testament to the quality of his language, his originality, and his ability to capture the darkness and light of our times. I send my condolences, and the condolences of the Government, to his family and friends." The Archbishop of Tuam, Dr Michael Neary, has described Tom Murphy as one of the greatest playwrights to emerge from the west of Ireland, and a champion of the underdog who was most frequently represented by a female hero in his plays. In a statement Dr Neary said he was deeply saddened to learn of the playwright's passing, and that the people of Tuam were immensely proud of their native son.